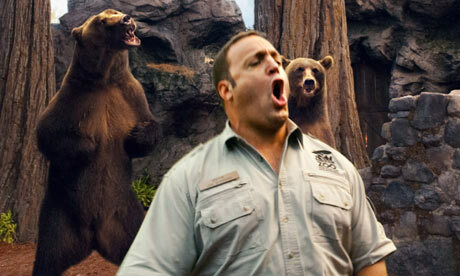 The setting of Zookeeper starring Kevin James is the Franklin Park Zoo in Boston. The movie is about James trying to win back the lady of his dreams with the help of some talking animals that act like Dr. Phil by dispensing advice on mating and dating. What comes through quite loud and clear in the film is the life lesson they put across It is not what the filmmakers may have intended, the stick to who you are and love will come along, no it is something entirely different than that. The movie makes innocent and naïve people like Griffin Keyes played by James hope they can have the sultry veterinarian Kate played by Rosario Dawson or the beautiful leggy Stephanie played by Leslies Bibb. Also, we are to believe that in five years working together Griffin never glanced at Kate with animalistic intentions. How is that possible when the actress exudes exoticness and sensuality even in safari khakis. 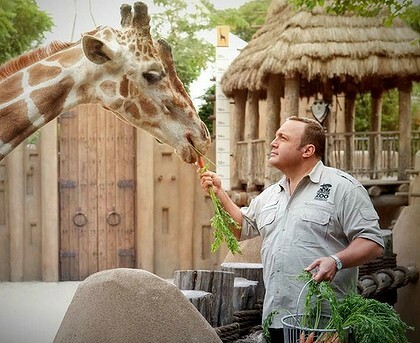 But poor casting is the least of Zookeeper’s worries. The story and script of which five writers had a hand including James is nothing shy of boring. James is doing exacting what he has done since the King of Queens. He can go through all the ups and downs of the movie and all his misadventures like taking a quill to the cheek, splitting his pants are kissing a rock with his face. The bottom line is it is just the same gimmick as before and gets old quickly. What is sad is that James has the talent he has shown it before when the script was there for him. In the movie the animals decide to romantically intervene on benefit of Griffin. They get fed up with his attitude and break their silence. Because they want to see him win back Stephanie who when you last saw her was dumping the poor guy after he proposed to her at the beach. What Stephanie wants is a sugar daddy and not a zookeeper. Five years have passed and he is still carrying on with a broken heart. But all sparks fly when Stephanie shows up at the zoo to attend Griffin’s brother Dave’s engagement party. Dave offers to give his brother a job at the dealership selling luxury cars since that is how Dave got beautiful girls like Stephanie. The animals immediately worry Griffin will leave so they intervene each given the opportunity to share its wisdom and their own unmistakable ways. What is difficult is the lack of continuity of the movie and how it shows things that are supposed to be Boston but are not. But things that pass for comedy are Ken Jeong as Venom who talks the gangsta talk and without a doubt the movie’s best part was while eating at a T.G.I. Friday’s Griffin who had taken Bernie out for the night end up jamming to Flo Rida’s Low party and slow dancing with ladies in the crowd. This entry was posted in Movie Review, Movie Trailer and tagged Ken Jeong, Kevin James, Leslies Bibb. A, Zookeeper, Zookeeper review, Zookeeper trailer. Bookmark the permalink. I still have not seen any of James’ movies. I don’t think that will change. This movie is completely forgettable, sadly, because it is an interesting premise. 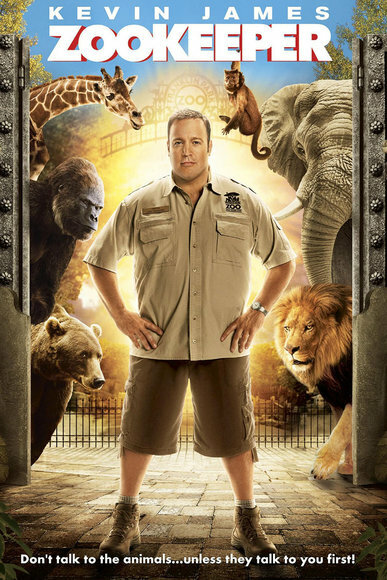 Like you said, Kevin James does have talent, but this movie doesn’t showcase that.